Copyright of kit is 1993. ​I live 56 miles S.W. of Ertl that is located in Dyresville, IA. I went to the factory discount store there numberous times and bought stuff. I bought this kit for $5.00 back in the 90's, when they marked it down from $19.00. Price was reduced because the kits were very crushed by the shrink-wrapping machine. Ertl began business as a metal farm toy manufacturer, of plows, tractors, combines etc. They later got into plastic kits and then went out of business. 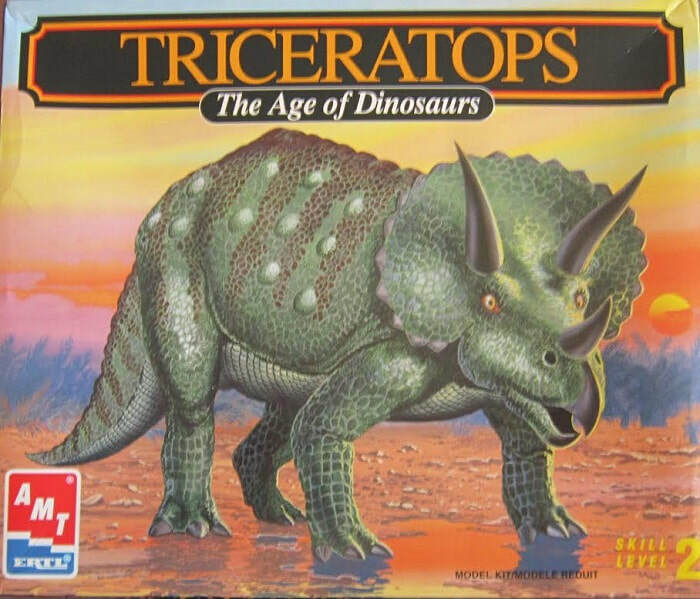 The box art shows a triceratops standing on wet ground. It is brown over a white belly, with some scales on its legs and face and raised bumps on its sides and white tusks and toe nails. One side panel has a color photo of the model made up in the box art colors and skill level is a 2. 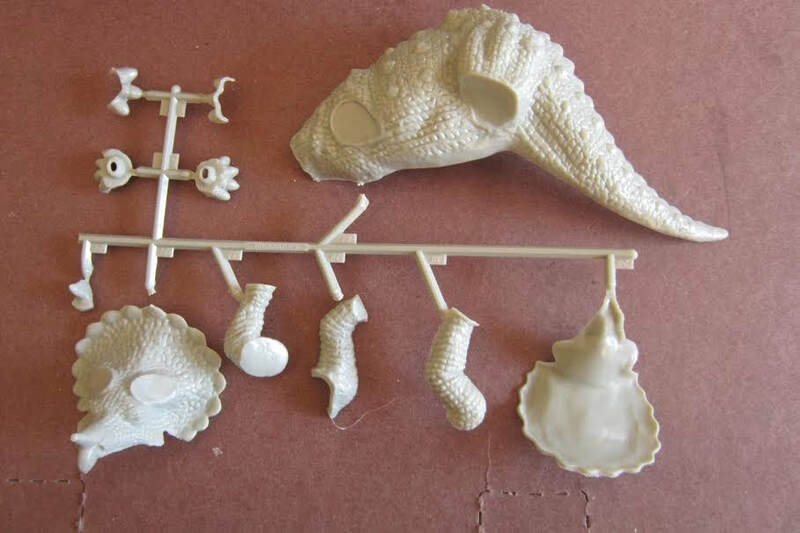 ​The other side panel repeats the color photo of the model made up, followed by Ertl's phone number to call for any kit problems, over the history of the triceratops, skill level 2, copyright 1993 and Ertl's address in Dyresville, IA and MADE IN FRANCE. The kit contains 2 light-gray trees in sealed clear cello bags. 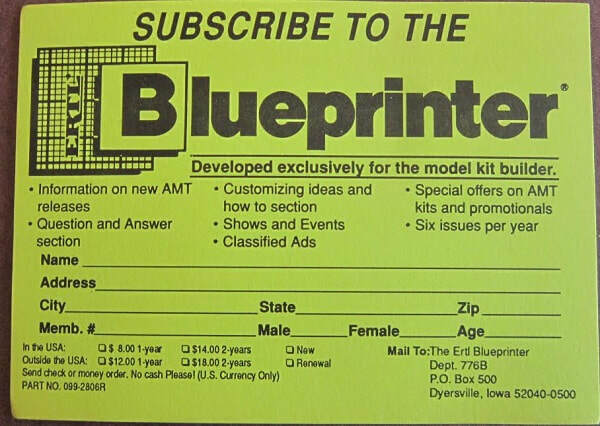 ​The card to use to subscribe to Ertl's Blueprinter magazine completes the kit's contents. 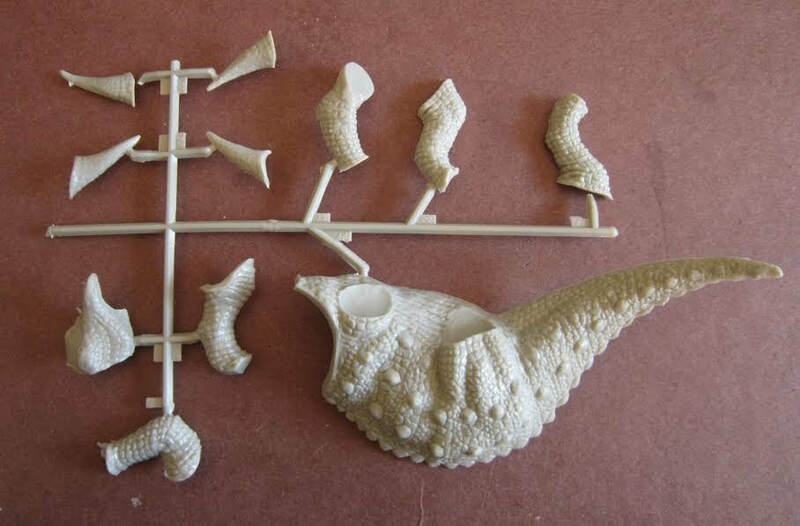 This is a neat dinosaur kit. Recommended.